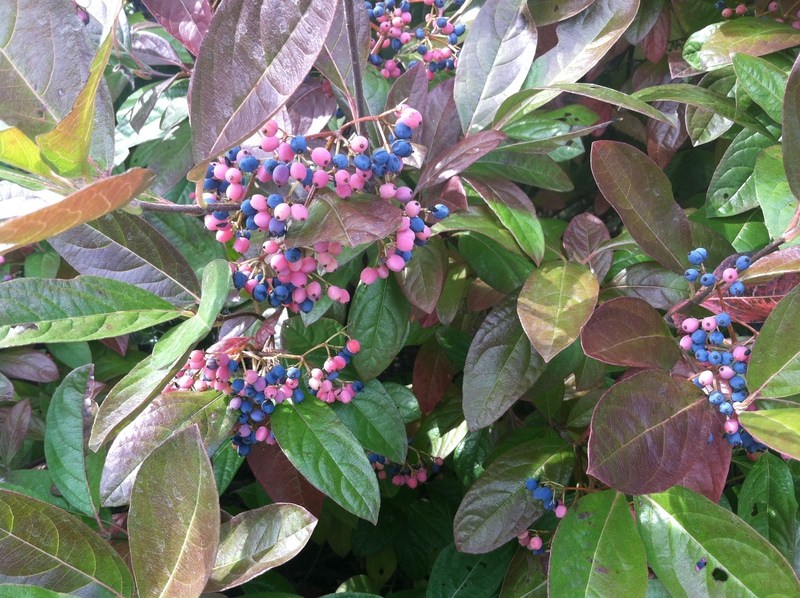 Beauty of Winterthur viburnum berries; Enjoy them before the birds get them! 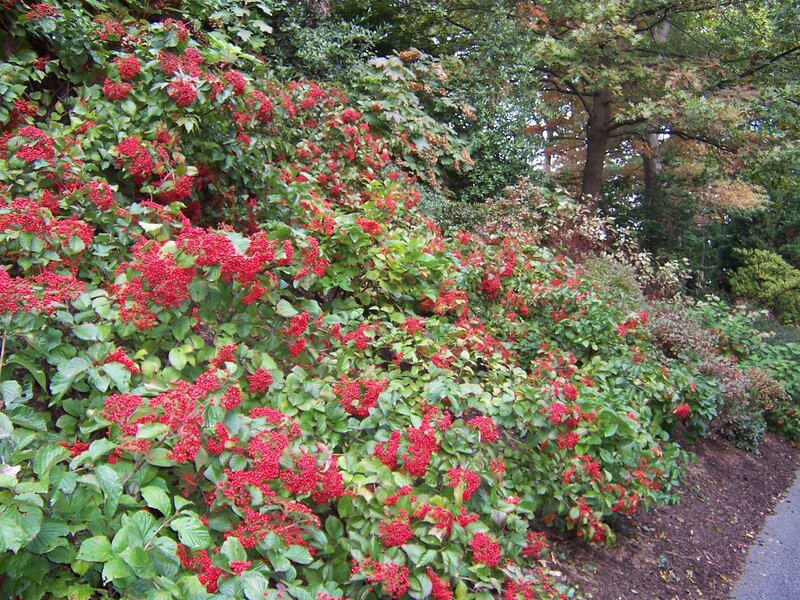 When selecting shrubs and trees to plant in your garden, consider not only the beauty of it’s flowers and foliage, but also the bonus of fruit or berries. Berries add another dimension to the attractiveness of the landscape which can last until late winter. Birds and other wildlife benefit from the berries as an important source of food when most other sources have disappeared. Even birds that primarily feast on insects will switch their diets in the winter to berries in order to survive the long lean winter months. Viburnums are the king of berry production for me in my garden. For a great article on Viburnums, go to Viburnum for American Gardens by Michael Dirr. The list of berry producing shrubs and trees includes service berry, viburnums, roses, beauty berries, hollies, sumacs, persimmons, bayberries, nandinas, and pyracanthas. I have highlighted a few that are easy to grow, last into winter and are particularly showy. 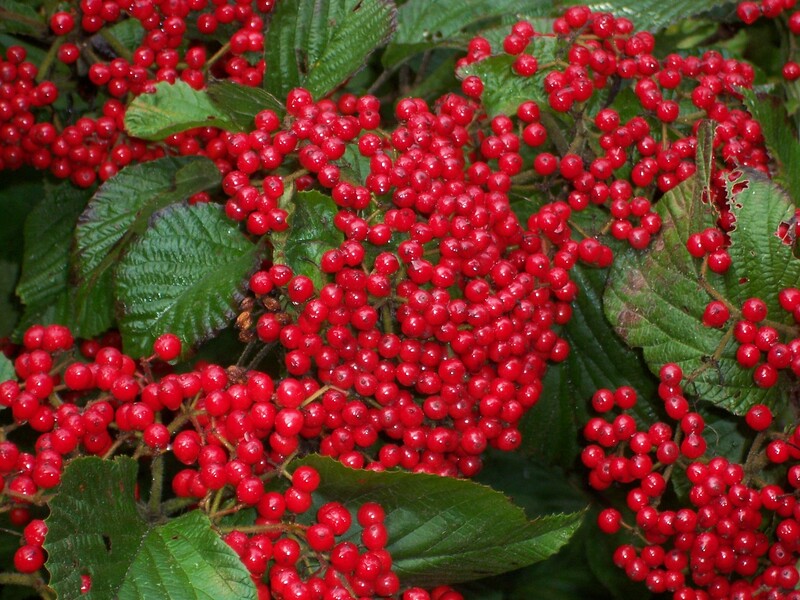 Viburnum dilatatum ‘Cardinal Candy’ is a nicely rounded deciduous shrub that will grow 6 to 8 feet tall. It likes sun or partial sun and carries an incredible display of abundant, glossy red fruit in the fall that persists into winter. It is blanketed with creamy white flowers in the spring and forms an attractive well branched shrub that fits in well with any landscape. It will cover a steep bank very effectively. ‘Michael Dodge’ has a different berry which sets it apart from most other Viburnums – yellow! 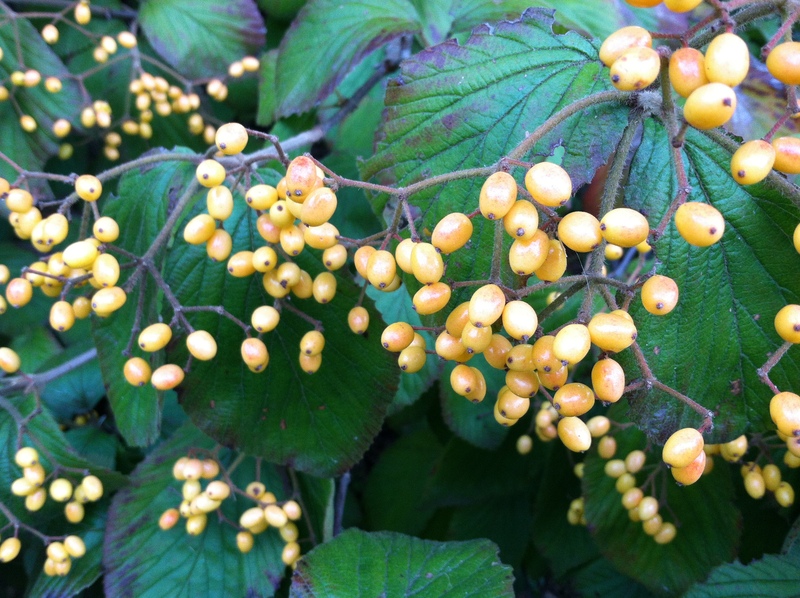 Yellow berries are a rarity in the plant world and I treasure this one. 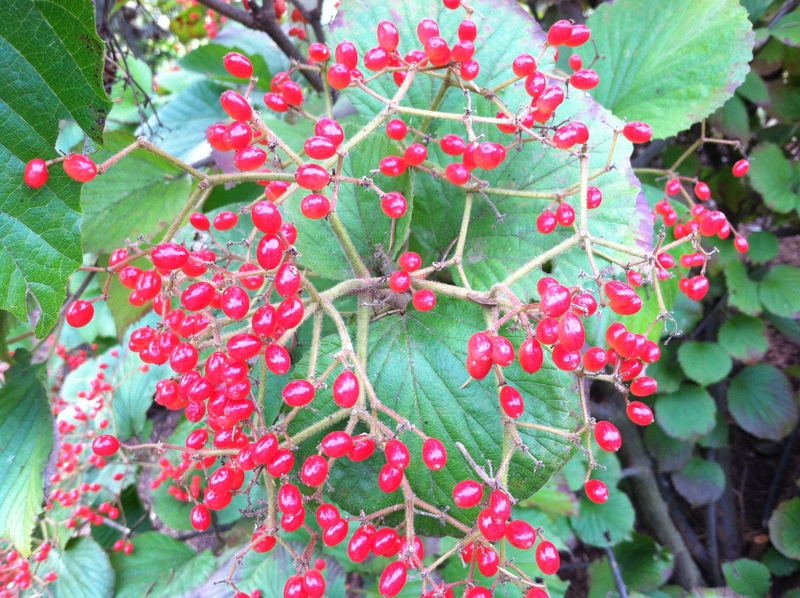 Erie Viburnum has the same red berries as Cardinal Candy, but I particularly like the fireworks display of berries. Doublefile Viburnums, Viburnum plicatum ‘Mariesii’, are as beautiful in flower as in fruit and does well in shade. Deer tend to steer away from this also which is a big plus. Making a beautiful screen, this deciduous shrub gets as wide as tall and resembles a layered wedding cake. 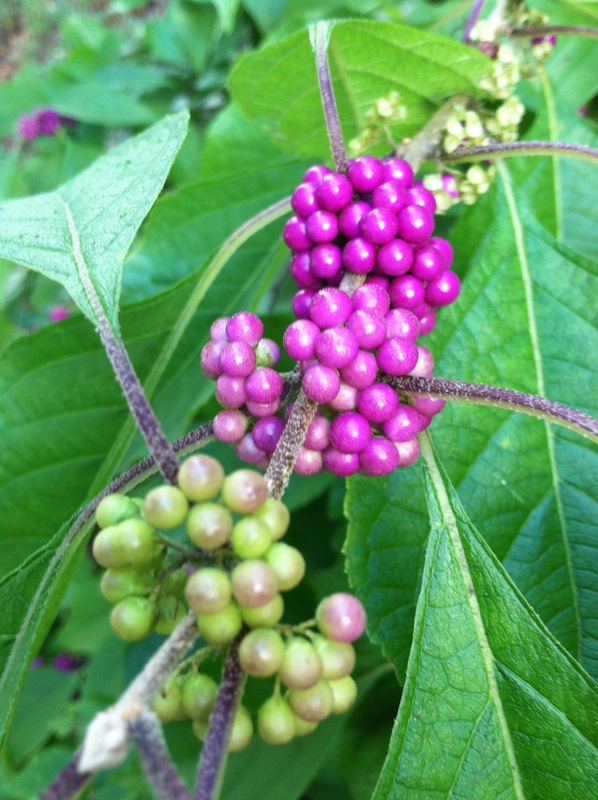 The American Beauty-Berry (Callicarpa americana ) grows 3 to 5 feet in height and width with long arching branches. It has yellow-green fall foliage and clusters of striking shiny purple berries held close to the branches. The berries also come in white. It is easy to grow in sun or part shade. I cut branches of this shrub and plunge them into vase of water to enjoy the beautiful berries and field a lot of questions about this unusual shrub. The very name tells it all. Berries lasting through a good part of winter, this shrub shines in the landscape. An unremarkable bush before the berries emerge and change color, once the leaves shed, this is my favorite berried shrub. Winterberry Ilex verticilatta, come in several sizes and colors. Winterberry Hollies (Ilex verticillata) are deciduous plants. 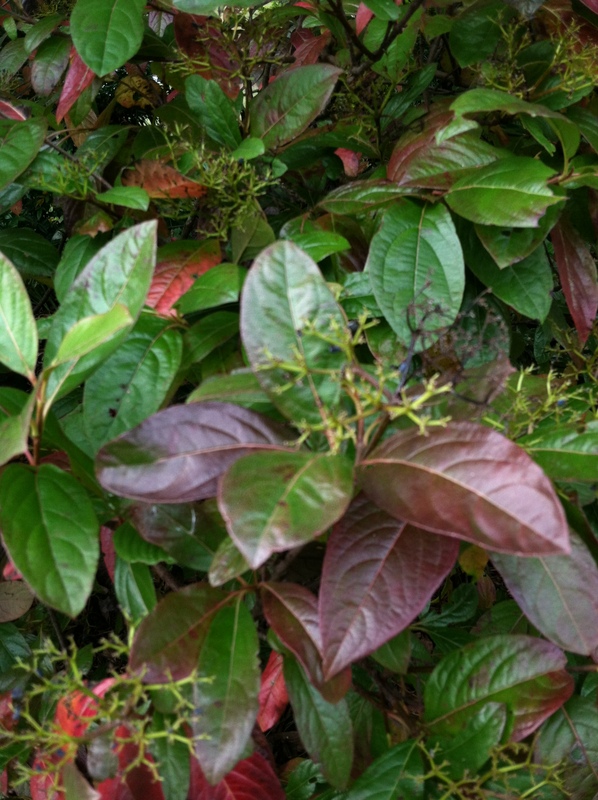 Leaves are mid-green and quite unlike the prickly, shiny leaves of evergreen Hollies, and drop off when frost hits. Winterberry Holly grows in full sun, partial shade, and even quite dense shade but don’t expect as many berries. Commonly found in wet soil, it also grows well in average soil and tolerates a fair measure of drought once established. It does require an acidic soil. Prune in late winter or after bloom, but be aware that pruning reduces fruit production. So I gather these are strictly bird berries, not people berries? We just get to look at the pretty colors. I love my viburnams and beauty berries. I must put in an Erie viburnam, too. There berries are worth having in the garden. Snow berry is another good white berry shrub. The wildlife don’t let the berries on my shrubs stay put long enough to be admired. I don’t mind because I plant mainly for them. Yes, It is also good for floral arranging. thanks! Love your posts each time they arrive. Wow, thanks so much! I love to hear feedback like this!